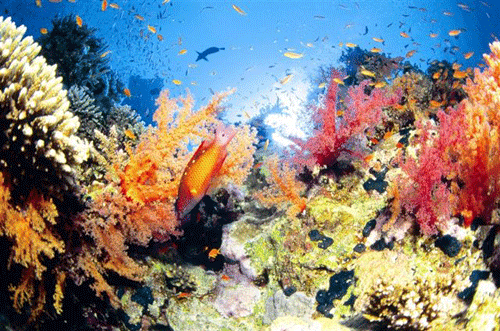 Beauty emerges as a judgment of great ecosystemic resilience and diversity, as is seen in the poster icon for vibrancy: coral reefs, many of which are now threatened. In the last post, WholeFoods Market was rated by RewardintheCognitiveniche (RCN) as tops for stewardship by a food market in the Santa Barbara/Goleta area. In this third and last of a series, which has been rating local supermarkets for stewardship (post 1, post 2) using the quality of online reporting as a proxy for that concept, we learn from the best of the best what seems to be working best, goals and plans for the future, and attractive innovations. Online reporting of ecological performance is possibly the most important interactive form of communication between producer-stakeholders and consumer-stakeholders. Both hold high stakes in a vibrant ecological future, not one more than the other. Neither can exist independently. The quality of life for both would be immeasurably diminished should the environment continue to be degraded. Yet many would ask why bother with on-line reporting. RCN argues that easily accessed online reporting of a company's mission and vision, its environmental policies and practices, and its stated commitment to community can be used as a reliable indicator of a company's stewardship ethic, or their sense of right and wrong, good and bad, true and false. Ecological stewardship is an ethic, not a state-of-being-process such as ecological sustainability. Sustainability as a concept means the keeping on of a given state. Because RCN thinks that quality of life requires continuous interaction between consumers and producers for wide-open sharing of values, responsibilities and privileges, the online publication of a company's stewardship ethic is key to our vision of a vibrant future. Publication of an ethic upfront, grabby, and freely accessible to all, without subscription fees, is the gatekeeper to this rating process. The bottom line for this post is the presence of sufficient information that is easily accessed and free to all to allow a concerned consumer to choose to support one supermarket over another, strictly from the perspective of ecological sustainability, by buying products there rather than elsewhere. Both criteria for evaluating stewardship and for evaluating sustainability reports are offered in this post. Throughout history, stewards have operated according to the ethic of noblesse oblige. The landed nobility felt their position entailed not only rights but responsibilities, and failure to assume such responsibilities was wrong and shameful. In 2012 those occupying the top spot in the cognitive niche are in an important way the nobility of our time. In developed countries, one of the major proofs of success is ownership of land, company, and home. Being so landed entails responsibilities. Until recently, producers felt entitled to secrecy and for the most part, kept consumers in the dark about what they were really doing in their operations, how products were made, ingredients sourced, and waste disposed of, as well as what their actual goals and plans were. We are either already privileged and responsible or if, in the case of developing countries, wherein being landed signals success, entering into the stewardship ethic. Though overlapping, stewardship and sustainability are different concepts.The definition of sustainability used here is unusual, because it is qualitative and always modified by the adjective ecological and framed by the underlying concept of ecological aesthetics. Aesthetics is always about the best elements linked in the best ways for the best outcomes. What emerges over time from all the groundwork is the aesthetic. The truism is that the cream rises to the top, and this is probably true of all major aesthetics. Ecological adds the dimension of what has been tried over evolutionary time and found good and true for survival of species. Sustainability ratings are very different from those of stewardship, which first and foremost opens the doors to full partnership between producers and consumers. If the only stewards are the producers--those who make wine, those who make toothpaste-- then the equation if lopsided. The values are different. Performance would be evaluated by different criteria. But producers cannot exist without consumers. Consumers have a right to know whatever they need to know to make good decisions about every product or service based on criteria of sustainability. This is the work of online reporting. Rating the sustainability of a market or company involves operational criteria such as powering plants with renewable energy, emitting less and less fossil-based CO2 or toxic emissions, controlling delivery processes for emissions and other wasteful processes, delivering high quality effluent water quality, zero manufacturing waste or from the product perspective, sourcing all products according to sustainability guidelines, meaning selling only sustainable seafood, using 100% renewable or recycled materials for all products and packaging, and not least, marketing only top quality products, and so on. Ecological sustainability means taking good care of whatever affects the best possible quality of life for all who inhabit the global ecosystem, implicating millions of species. This particular definition is both ethical and qualitative and ignores profit and economic growth. It celebrates beauty and the evolutionary processes through which a judgment of "Beautiful!" may emerge. This definition of ecological sustainability is framed by evolutionary aesthetics; it envelopes the preservation of biodiversity, conservation and/or restoration of natural and species' resources; the protection and restoration of habitat; and an educative component, requiring re-evaluating both consumption and production, which have run away from all logical control and seem hell-bent on global degradation. At the bottom of this post are major concerns for sustainability report evaluation. But first, below is a list of stewardship evaluation criteria using online reporting as proxy for stewardship. 1. Free and open access of information to all. No subscription or membership fees required to choose products and services based on good and sufficient information. 2. Clear Goals and Values Statement within 2 clicks. Plan to achieve goals. Checklist/benchmarks to evaluate progress. Enough information to create a company profile and compare it with another company's profile as a basis for informed decision-making: choosing to support one market rather than another. 3. Compliance with the GRI guidelines of transparency, comprehensiveness, relevance, truthfulness, timeliness, certifiability, interactivity with stakeholders, quantitative values for most categories, reference communities made explicit, all categories relevant to these communities. Metrics that can be compared both within the company and with other companies, such as tons of waste sent to landfills. Reference communities, relevant contexts for all metrics. Frequent re-evaluation and re-prioritization. 4. Innovation, leadership, creation of new value. How that new value may impact the local community and possibly the global ecosystem. Two models are offered here: both models are exemplary of online reporting, Proctor and Gamble presents sustainability information in an informative and unusual way, but is not local to the Santa Barbara area, and WholeFoods is exemplary for stewardship as well as its sustainability practices. Both reflect local and global connections. Both are committed to engaging communities in their sustainability programs. WholeFoods is a leader in linking market consumption with market education of sustainable seafood. Proctor and Gamble: Sustainability is one of four main menu choices on the PG homepage, you can't miss it. With one click you reach a comprehensive set of sustainability information options, including an overview, a link to environmental sustainability as remarkably different from the triple bottom line version, a report card, sustainability goals, and more. P&G uses a life cycle analysis, highly favored by the author of this website They study consumer behavior and seem to make few assumptions without major research. 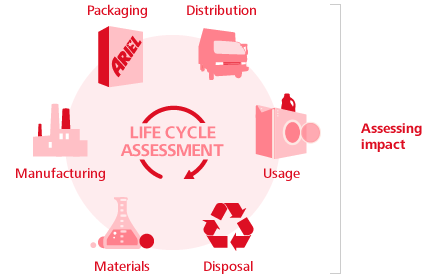 "At P&G, every sustainability innovation begins with a deep understanding of consumers." P&G is focused on mainstream consumers, because they would seem to have the biggest impact speaking in terms of volume. They also appear to be following the trend from neuromarketers: because sustainability is a top priority item in the menu, we can assume the menu reflects major interests and values. Companies that claim to be committed to sustainability but fail to feature that concept on their landing page are not up on their neural marketing research. Although environmental reporting may be considered a young genre, two-thirds of the world's leading companies now report formally on sustainability. Fewer companies report online, yet for all 21st century communicators, the Internet is unquestionably the premier medium for all communication. For reasons that include image, competition, corporate responsibility, pressure from stockholders, investment considerations, standardization across enterprise and industry sectors, and a sense of stewardship that may transcend company lines, business is now committed to report sustainability. The triple bottom line of economics, social equity, and environment is also beginning to be replaced by the elusive line of ecological well-being, implying evolvability. Some of the companies not rated tops for stewardship are, nonetheless, high performers for sustainability practices, and companies such as Costco have taken unusual advantage of their worldwide plants to install solar arrays and skylights to reduce fossil fuel spending. Ralphs (Kroger chain) has a warm and people friendly section on green living as well as impressive performance. For example, nineteen of their 39 manufacturing plants sent“zero waste” to landfill, and energy consumption was reduced in all Kroger stores by 31% since 2000. Vons (Safeway) was recognized by Greenpeace as the most sustainable seafood grocer for two consecutive years (though I do not observe in my local SB Vons any attempt to educate consumers regarding seafood sustainability.) Price aside, all shrimp, which is the seafood I buy most frequently after salmon, seem to be equal--from the sustainability perspective-- at the Von's seafood counter, whether wild, farm-raised, from wherever, and however harvested. This is a missed opportunity to educate consumers about seafood sustainability, such as can be found at the Monterey Bay Aquarium's Seafood Watch shrimp guide , where specific guidelines are given for shrimp from different areas. "In addition, Safeway was one of only two national retailers to score a green rating, the highest category of ratings that a grocer can score. This marks the first year in the six-year history of the Greenpeace scorecard that any retailer achieved a green rating.The "Carting Away the Oceans" report and scorecard, released May 2, rates retailers' seafood policies, initiatives, product labeling/dissemination of information about products, and practices surrounding the sale of certain unsustainable or "red list" species. Greenpeace, in the introduction to the report, cited Safeway's "thorough and varying combinations of progressive policy development, public support for conservation measures, and the elimination of unsustainable seafood inventory items," as elements that make the company an "undeniable leader within the industry." Most of the large supermarket chains publish specific metrics in their future plans, such as achieving zero waste in all stores by such and such a date, or becoming carbon neutral, or using x % of renewable energy by 2025, etc. Few have stated plans to make the consumer more informed or a more significant collaborator in their sustainability futures. There is little innovation so far in community engagement. Our next series if all goes as planned, will focus on the stewardship of local (Santa Babara County) wineries.